Father Michael Tobin set his personal best marathon time of 3 hours and 57 minutes at the 2011 Kentucky Derby Festival Marathon. His best race, where he ran a negative split — meaning he ran the second half of the 26.2 mile race faster than the first half — was in Houston in 2018. Next month, he plans to run in the Boston Marathon in celebration of his 25th anniversary of priesthood. He also aims to fund heart surgeries for at least five children with Down syndrome. Father Tobin, 56, is the pastor of the Church of the Annunciation in Shelbyville, Ky., and St. John Chrysostom Church in Eminence, Ky. While he’s an experienced runner, he’s not fast enough to qualify for the Boston Marathon, set for April 15. But there’s another way into the prestigious race: joining a charitable team and raising money for that cause. “I decided for my 25th anniversary that I would try to enter through the back door —literally pay my way in through donations,” he said. After his parishioners gave more than $4,000 for his cause and he put in $2,500 himself, Father Tobin started applying to charity teams that assist children with Down syndrome, a cause that’s special to him. The David Ortiz Children’s Fund accepted him, recognizing what the fund’s representative called his “impressive” fund-raising efforts and passion for his cause. Now, his fund-raising effort has yielded nearly $17,000 and he’s set his goal at $25,000. His fund-raising goal would provide heart surgeries to five children with Down syndrome, a need that’s common for these children, according to the Ortiz fund. Father Tobin’s interest in the cause is firmly rooted in his life as a priest. In recent years, he said, “I noticed the incidence of Down syndrome in the Hispanic community at Annunciation. You see one, then two now we’re up to four families. I realized I needed to discuss this with the Hispanic community. “People feel awkward and even ashamed” when they don’t understand Down syndrome, he said, adding that he felt a duty to support and walk with parents. He set aside a pew for families affected by the syndrome at the Mass for Our Lady of Guadalupe last December. And the month before, he convened an event to raise awareness about Down syndrome at Annunciation. He approaches this kind of pastoral work — and all the other work of a priest with two parishes — the same way he approaches running, he said. “We can’t run a marathon if we’re not well-trained,” he said. 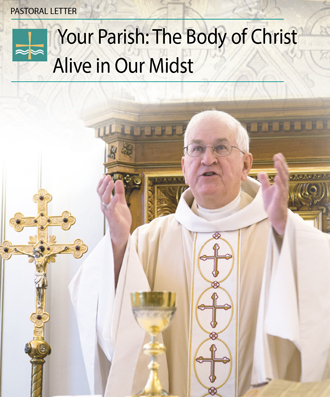 “A parish cannot expect to celebrate the Triduum if we’re not well prepared. You can see RCIA as nine months of preparation for a marathon, which is the Easter vigil. “You have to literally have faith that you’re going to cross that finish line, even though you don’t know how you’ll do it,” he said. Sometimes the way is providential. While Father Tobin was applying for charity teams, a child who attends a weekday Mass at Annunciation each week with his family was awaiting results from a recent heart surgery. The child, Max Michalak, also has Down syndrome. His mother, Penny Michalak, asked Father Tobin to pray for Max. “It was providential. Already I’m working with a Down syndrome child and suddenly I’m with the charity that’s working on heart surgeries,” Father Tobin said. Michalak noted that she and her husband adopted Max from Poland in 2015 with a heart condition. Max was given six months to live last summer. But on All Souls Day, Michalak said, Max’s test results showed improvement. In Boston Father Tobin plans to wear a wristband with Max’s name on it. With the assurance that money he raises will help children with Down syndrome, the Michalak’s made a donation and set Father Tobin’s fund raising — originally aimed at $10,000 — on the path toward his $25,000 goal. With about $8,200 left to raise, Father Tobin will hold an auction after the Annunciation fish fry March 22. He’ll be offering up Major League Baseball gear donated by the Ortiz fund. Father Tobin is also raising money through a web-based crowd-funding site called crowdrise.com. The direct address to Father Tobin’s fundraising page is: crowdrise.com/o/en/campaign/david-ortiz-childrens-fund-boston-2019/father-miketobin. The Ortiz fund was established by former Red Sox player David Ortiz. His charity provides pediatric healthcare to children in New England and the Dominican Republic.